Trans-Am Driver Amy Ruman finished 2012 in 2nd overall. Vice President of Cenweld Corp.
Amy is a former Field Hockey coach at Stow-Munroe Falls High school where she coached for 9 seasons. She enjoys being involved with the teens in her community and loves to teach the competition that drives her, always striving to involve young women in competitive sports. Amy is a 1996 graduate of Kent State University, earning her B.B.A. degree in Business Management with a Marketing minor. She also enjoys recreational softball, biking, and skiing. After making history as the first woman to win a Trans-Am race with her breakthrough victory in the 2011 season-finale race at Road Atlanta, Amy Ruman looked to build on that record-setting accomplishment as she set her sights on a successful 2012 season. Those ambitions were met as Amy Ruman and her Ruman Racing squad posted a stellar season of results in 2012. Entering Rumans sixth year of Trans Am competition and looking to build on the strong third place points finish to 2011, the Ruman Racing squad took ownership of a new C6 Corvette sponsored by McNichols Co., Goodyear, and Cenweld Corp. Though the new machinery brought a learning curve for the team, the Bob Ruman-led group quickly got acquainted with the new chassis early in the season and put those lessons to work. The performance of the new Corvette, the knowledge and expertise of Ruman Racing, and Amys stout talents behind the wheel combined for a brilliant 2012 season which saw Ruman fighting for the Trans Am championship title all year long. Ruman amassed an impressive seven podium results in 10 races  including two victories at New Jersey Motorsports Park and Brainerd International Raceway. Those results saw Ruman finish the Trans Am season runner-up in the championship  just 11 points shy of the title. In addition to Trans Am, she also picked up three wins and two pole positions in SCCA GT-1 National competition. She went on to finish fourth in the highly competitive SCCA GT-1 National Championship Runoffs held at historic Road America. After finishing sixth in the season opening event at Canadian Tire Motorsports Park, Ruman first stood on the podium at Lime Rock Park  the second stop on the Trans Am schedule. It was Rumans debut at the quick 1.5-mile Connecticut road course but she wasted no time finding the fast way around the track. Looking like a Lime Rock veteran at the high-speed circuit, she opened the race from fourth on the grid before driving to third at the finish. Next up was Rumans home track of Mid-Ohio Sports Car Course located just a couple of hours south of the Ruman Racing shop in Munroe Falls, Ohio. With a large crowd of family, friends, and Ohio fans in attendance, Ruman started third and immediately moved into second at the start. She would take over the lead following a restart to lead her first-ever Trans Am laps at her home track. Despite a drink bottle failure during the 100-mile race held under the extremely hot Midwest summer conditions, Ruman remained busy behind the wheel making the most of the available in-car adjustments to compensate for the continuous changes in handling due to the extreme heat. The changes helped but were not enough to hold off a hard-charging Simon Gregg. After a valiant side-by-side battle for the lead, Ruman ultimately ceded first place and took second at the checkered flag. Following her two consecutive podium finishes, Ruman was ready to stand on the top step as she continued to gain ground in the championship points. And she did just that in Round 4 at New Jersey Motorsports Park as Ruman dominated the final stages of the race and crossed the finish line with a 20.090-second gap over the rest of the field. But the win didnt come easy for Ruman when unfortunate contact with Tony Ave jeopardized her shot at victory and the No. 23 McNichols Co./Goodyear/Cenweld Corvette machine sustained a flat tire forcing her to pit lane for a tire change. But luck was on Rumans side and the track went yellow while the No. 23 was on pit lane. Ruman managed to stay on the lead lap and the No. 23 lined up third with just seven laps to go. Ruman improved to second with five laps to go and regained the lead on the following lap and never looked back to claim her first Trans Am victory of the season. Ruman followed up that effort with a run to second place at historic Watkins Glen for her fourth consecutive podium as Trans Am marked the half-way point of its race season. It was a busy weekend of on-track action at the Glen with Ruman also competing in SCCA GT-1 competition. A mechanical issue saw the No. 23 McNichols Co./Goodyear/Cenweld Corvette start from 19th on the GT-1 grid but Ruman made it look easy as she maneuvered from the rear of the field to claim her third GT-1 victory of the year. Heading into Round 6 at Road America, Ruman entered the weekend second in the championship and had hoped to keep her podium streak going. But a strong run was cut short when contact with the No. 87 of Doug Peterson saw the No. 23 sustain damage forcing Ruman to pit for repairs. Great work from the Ruman Racing crew kept the No. 23 McNichols Co./Goodyear/Cenweld Corvette on the lead lap and Ruman restarted 17th with 10 laps to go  the No. 23 running without its hood. Ruman made the most of the restart to move up six spots to run 11th with nine laps to go and ultimately took ninth at the checkered flag. Focused forward, Ruman Racing set their eyes on the next race  a double header event at Brainerd International Raceway. While tire issues prevented Ruman from adding to her podium tally when she scored fourth in Race 1, she seamlessly drove to victory in Race 2. Holding a 16-second advantage over the rest of the field at one point in the race, she defended against a late-race charge from Simon Gregg to claim her second win of the year with a .673-second advantage. With a two-month break between the Brainerd International Raceway rounds and the season-finale event, Ruman Racing was well-prepared for the final two rounds as they returned to the site of Rumans breakthrough victory at Road Atlanta. Once again at the controls of the No. 23 McNichols Co./Goodyear/Cenweld Corvette which had proven to be quick all season long, Ruman capped off an incredible 2012 season with a double podium weekend of two third place results. In Race 1, Ruman started third before taking over second in the early stages of the race. She would run second for most of the event before contact with nine laps to go saw the No. 23 sustain damage but rally to third at the finish. With Race 2s qualifying order set by the results of Race 1, Ruman opened Sundays race from third on the grid. Unfortunately, a quick spin on Lap 1 saw Ruman playing catch up for most of the race. Running lap times faster than the leaders, Ruman began to dig into the nearly 30-second gap between her and the lead pack of cars. Ruman Racing welcomed a late-race caution as the field bunched back up. Running second at the restart, the stage was set for an eight-lap dash to the finish making a valiant battle between Peterson, Ruman and Ave for the win. Ruman eventually relinquished second place to finish third for her seventh podium of the year. A very impressive season combined with the strong results in the season-finale saw Ruman solidify her runner-up finish in the 2012 Trans Am Championship. Two Trans-Am drivers, Amy Ruman and Tony Ave, are among the racers earning honors from the American Auto Racing Writers and Broadcasters Association (AARWBA) following their outstanding 2011 seasons. Ruman, driver of the McNichols/Goodyear/Cenweld Chevrolet Corvette, won AARWBAs Rising Star award, following her breakout year. Ruman, age 37, won the season finale at Road Atlanta, to become the first woman ever to win a Trans-Am Series race in the series 45-year history. Wow what a surprise. I was thrilled to hear that I had been selected for the Rising Star Award by AARWBA, stated Ruman. What an honor to be named among some of racing's finest drivers! The auto racing broadcasters and journalists have a unique perspective in that they are following all forms of auto racing across the country. So to have been chosen for this award from among all the racers they follow is just incredible. Their vote of confidence is inspiring. Winning a Trans-Am race was a feat that eluded all woman competitors that came before Ruman, including the likes of Lynn St. James and Deborah Gregg, arguably the two most accomplished woman drivers in Trans-Am history. Gregg, who drove a Lincoln Mercury Capri for Roush Racing from 1985-1994 (58 career starts), earned back to back 3rd place finishes at Road America and Memphis in 1987 in her best ever showings, en route to a fifth place finish in the series that year. St. James, a Trans-Am competitor from 1983-1990 (53 career starts), drove her Roush Merkur XR4Ti, to 3rd place at Long Beach on her way to seventh place that year. Ruman finished the 2011 campaign with three podium finishes (another woman best) and placed third overall in the Trans-Am Series Championship, the highest finish ever for a woman. Ruman has achieved this success in a relatively short career. She debuted at Cleveland in 2005, and the Road Atlanta win was only her 22nd career race. Rumans achievements and those of all honorees will be celebrated at the 42nd AARWBA All-America Team Banquet, which takes place on January 8, 2012 in the Grand Hall at the Train Station of the Crowne Plaza Hotel in Indianapolis, IN. Tickets are available to the public at www.aarwba.org . After knocking on the door several times over the past few years, Amy Ruman, of Kent, Ohio, finally broke through for her first SCCA Pro Racing Trans-Am Series victory in the 2011 season finale at Road Atlanta and became the first woman winner in the 45-year history of the series. The key to the race for Ruman was the restart following the fourth of five full-course caution periods in the 40-lap race. Running second in her No. 23 McNichols/Goodyear/Cenweld Chevrolet Corvette behind leader Mike Lewis, of Poway, Calif., Ruman got a good jump to take the lead heading into Turn 1. A few moments later, Glen Jung, of Osteen, Fla., and John Baucom, of Charlotte, N.C., got together and brought out the day's final full-course caution. The remaining three laps in the race were run under yellow, giving the victory to Ruman. "It feels great," Ruman said. "I feel like it's long overdue for our team, but I'm excited to be up here. We worked really hard race after race and unfortunately, our best results were always third. We couldn't seem to break that barrier the last couple years. I led at Brainerd and then it started raining, and it just seemed like there was always something blocking our way, mechanical problems or getting hit. "This is just a great way to finish the year for our team, especially McNichols Co. and Goodyear. They've been backing me for years and I finally delivered a win. The timing just worked out for us. I was just patient trying to keep everybody at bay and if they got around me, I was just going to hold off to the end of the race and make my move. Unfortunately for Mike, he made a mistake and I capitalized on it and the other yellow came back out. You've got to race to the checkered flag and that's what we did. Even on those last caution laps, those were the longest ones of my life, because I didn't know if they were going to hurry up and go one more. But I just was patient and just praying that everything would stay together and we would see the checkered and we did." For a while it looked like Lewis might get another victory just five days after scoring the GT-1 National Championship at the SCCA Runoffs at Road America. He took the lead when 2011 series champion Tony Ave, of Maiden, N.C., pulled onto pit lane with a mechanical problem on Lap 20. He fell victim to the final restart, however, and was forced to settle for second in the No. 12 Goodyear/Cyclo/Red Line Oil Jaguar XKR participating in his first Trans-Am race of the season. "It's good for the series that Amy won, Ave said. "I'm really happy for her. She did a great job, earned it, and I'm just proud of her." Coming off a very successful season last year, Amy Ruman and Ruman Racing will be back in action to compete again in the 2011 SCCA Pro Racing Trans-Am Series and SCCA GT-1 National venues. 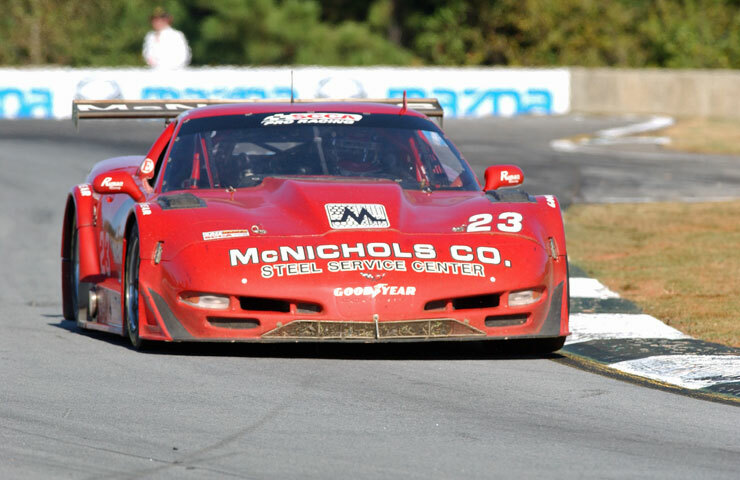 Ruman returns to Trans-Am driving her trademark red #23 McNichols Co./Goodyear/Cenweld Chevrolet Corvette. Ruman's long time primary sponsor, McNichols Co., is returning for another season with the Ruman Racing team. This marks the 10 year anniversary of sponsor partnership between McNichols Company and the Ruman Racing team. "I can't believe we are entering into our 10th consecutive year together with McNichols Company! Our partnership throughout the years with McNichols has really developed into a "HOLE PERFORMANCE" package," exclaimed Ruman. Ruman and the team are headed to Florida on Monday to compete in Trans-Am Round 1, which is part of the famous American Le Mans Series 59th running of the Twelve Hours of Sebring race week. "Sebring couldn't be a better race to start off the season since McNichols is headquartered in Florida. We know we'll put on a great show for them as well as the other fans at the 12 Hours of Sebring race week. "We are really looking forward to Amy and the team competing so close by," said McNichols Vice President Steven McNichols, who will be attending Friday's race. At Sebring, Ruman will take to the track for two test sessions on Tuesday March 8th, followed by a practice session Wednesday afternoon. Qualifying will be Thursday morning and start of the 100 mile Trans-Am race will be Friday morning at 9:10am. For quick news and updates during race weekends, please follow Ruman Racing and the Trans-Am Series on Twitter @rumanracing and @TransAmSeries. Be sure to "Like" our official pages on Facebook: Ruman Racing, Amy Ruman (Official Fan Page), McNichols Company, and Trans-Am Racing. Ruman Becomes First Woman to Win in 45-Year History of Trans-Am in Wild Road Atlanta Season Finale. Amy started third on the grid in the first Trans-Am race of the Brainerd Doubleheader. She took fourth in Round 7. She put together an outstanding charge despite the opening-lap incident with Ebben and two trips to pit lane during the race. Amy started Round 8 gridded 2nd. Amy Ruman was gridded 3rd for the Pro Racing Trans-Am race at Road America. She crashed on lap 19 of the 25 lap race and finished 11th. Rumans 2010 season was probably one of the most successful seasons in her many years of racing. She ran a combined season of Trans-Am Series races and GT-1 National races again, and was very triumphant on both fronts. Amy ran six of the ten races in the Trans-Am Series schedule; qualified in the top-10 for all six races, and finished in the top-5 for all but one of the races when she suffered a mechanical problem. She captured three 3rd place podium finishesat Road America, Toronto, and Autobahn; was 5th at New Jersey, 8th at VIR (mech), and 4th at Road Atlanta. For the fourth time in her racing career, Ruman was the GT-1 Northeast National Points Division Champion, capturing 3 pole positions out of 6 races, scoring 4 wins and a second place finish at the famed June Sprints National at Road America, WI. Amy competed again in the SCCA National Championship Runoffs held at Road America, where she had the best finish of her Runoffs career earning a 3rd place spot on the podium. For the third consecutive year, Amy was crowned SCCA Northeast National Points Division Champion for GT-1. Running in eight races, Ruman scored six pole positions, four wins, two-second places, and currently holds five track records. In her first time running at Road America in the famed June Sprints, she qualified 5th and finished 8th after breaking a steering control arm during the race. Finishing the 2008 season off, she ran her sixth consecutive SCCA National Championship Runoffs. Ruman qualified 5th but finished a disappointing 14th after encountering a wing problem at Heartland Park Topeka, KS. For the second consecutive year, Amy was the SCCA Northeast National Points Division Champion for GT-1. She captured seven pole positions out of seven races, scored five wins, one second place finish, and currently holds four track records. Amy won races at NHIS, Nelsons Ledges, BeaveRun, and Pocono. At Summit Point, she slipped into second when it started raining, after leading most of the race. She did not start at Watkins Glen do to car problems. Ruman ended the season competing in the SCCA National Championship Runoffs at Hearltand Park Topeka, KS October 13. She qualified 6th, but was hit from behind on the 1st lap of the race. The car sustained significant damage and she was unable to continue. Amy was the SCCA Northeast National Points Division Champion for GT-1. She captured six pole positions, scored three wins, and posted four new track records. Amy won races at Summit Point, NHIS, and Nelsons Ledges. She had two close second place finishes at Pocono and a third place at Watkins Glen. She finished 6th at Topeka and fell out of BeaveRun after breaking an input shaft. Amy scored her first top-five finish at Topeka in only her second Trans-Am Series race, finishing 5th. She will round out the season at the SCCA National Championship Runoffs to be held at Heartland Park Topeka in October. Amy finished second in the SCCA Northeast National Points Division for the second year in a row, falling short of being Champion by one point. She ended the season with a 6th place finish in the Kohler National Championship Runoffs at Mid-Ohio. She had busy year running in 12 races, which included her Trans-Am Series debut at the Cleveland Grand Prix, where she qualified 8th and finished 10th. She posted two wins - Nelson Ledges and BeaveRun. She captured five pole positions at Nelson Ledges, Mid-Ohio, BeaveRun, and two at Pocono. Amy had three second places, two third places, and fell out of the Moroso, Mid-Ohio, and one Pocono race due to mechanical issues. Amy ran a jam-packed season this year competing in 12 races, which included her second entry in the Runoffs. She finished second in the Northeast National Points Division, with eight top five finishes, which included a win, six-second places, and a fourth. She ended the season with a 9th place finish in the Kohler National Runoffs at Mid-Ohio. During the regular season, Ruman grabbed a win at Mid-Ohio in June, captured six second places at Pocono, Pocono, Nelson Ledges, NHIS, Summit Point, and Moroso; had a 4th at Sebring and a 6th at Mid-Ohio in August. BeveRun and Watkins Glen were huge disappointments for Amy this year. She suffered a major crash in qualifying when another car spun in the middle of blind turn, blocking the track. After hitting him nearly head-on, Ruman had minor injuries with a sprained ankle and bruises. Three weeks later, the crew repaired the damage and Ruman was back in the car leading the race at Watkins Glen, when the motor let go. Amy switched gears and focused on running in GT-1 this year. She had all top five finishes in GT-1. In the Super Bowl of club car racing, the National Valvoline Runoffs at Mid-Ohio, Amy finished 5th in a very competitive field of GT-1 racers. She ended the regular season with a 4th place at Mid-Ohio. Took a 2nd at Watkins Glen, and got her first official win at Beverun. After qualifying 39th in the rain and missing the dry qualifying session, she finished in a inspiring 5th at the Mid-Ohio national. A controversial disqualification took her out of 1st at the Nelsons Ledges national. Switching back to the Spec Racer, she ran the Pro double at Beverun and took a 4th and a 6th place. She opened her GT-1 season at Gingerman finishing in 3rd. Summit Point was the 2003 SRF season opener where Amy finished 23rd after a mid-race incident. This year, Amy expanded her racing to running in SRF and GT-1. Rounding out the season at the VIR double Pro weekend, Amy finished 15th (qualified 27th) and 39th after a spin. Switching gears back to GT-1, Amy qualified 8th and finished in 12th after contact in a first lap incident. She took a 15th in the Pro Spec Race at Mosport, and had a DNF after an S2 took her out at NE NHIS national. Amys season opened at the Florida nationals for the first time running her Dads Corvette in GT-1. She qualified an impressive 3rd at Moroso, but a gearbox problem gave her a DNF. She qualified 4th at Sebring and finished 3rd. Amy focused running in Pro/National SRF races this year. Finished up the season with a 5th at Mid-Ohio national. She took 15th at the Cincinnati Airport course in Pro Spec Racer. In the double Pro/National weekend at VIR, Amy captured an impressive 14th and a 13th after qualifying in 25th and 27th. She took a 16th and a 29th (after a spin) at the Spec Racer Pro/National Weekend at Watkins Glen. At the Pro Mid-Ohio race, she had a 17th place finish. Amy finished in 7th for her season opener at the NE national at Nelsons Ledges. Amy finished 16th at the San Diego Pro Spec Racer finale moving up from her qualifying position of 32nd. She finished 7th at the both the WGGT races in Las Vegas and Texas. At Pocono, Amy finished 10th after qualifying 6th at this SCCA national in the pouring rain. Qualified 4th, finished 6th in CE national at Nelson Ledges, also finished 17th in a CE national at Mid-Ohio, and captured a 5th in the SRF NE national at Nelson Ledges in OH. She finished 8th in round two of WGGT at Lowes Charlotte NC. Amy qualified 3rd in the season opener of the WGGT Series at Sebring, came back through the field to finish 6th after spinning and dropping to last place. Amy won the 1999 SCCA Mahoning Valley Regional Championship with six victories in SRF. She also had 4th and a 6th in the nationals in a SRF at Nelson Ledges this year. She finished 33rd in Pro Spec Racer at Sebring, FL and 24th at Grand Rapids, MI. In the WGGT series, Amy qualified 3rd (second row) at Portland and finished 9th. At the April Atlanta WGGT race Amy finished 10th, were she also had the pole in her qualifying race. She finished 12th at Sears Point, 16th at the Petite Le Mans, and was involved in a crash at Laguna Seca. At the season finale in Las Vegas, she qualified 6th and moved up to 3rd until 5 laps from the finish, her clutch failed. Amy, along with sister and teammate Niki Ruman were invited to join the inaugural season of the Womens Global GT Series - an invitation only world showcase of top female racing drivers. After a frustrating season, Amy finished 13th in the WGGT points standings. In January Amy and Niki were on the only all female team to compete in the 24 Hours of Moroso in a Spec Racer Ford; their Spec Racer Ford was involved in a crash in the 20th hour while running 3rd in class; the team placed 9th in class and 41st overall. Amy raced nine national and regional SCCA SRF races last year. She had three top-ten finishes, including a podium 3rd place finish. Competed in her first endurance race at the 24 Hours of Moroso in January and finished 12th overall and 5th in class, on a family based team with sister Niki Ruman and father Bob Ruman along with two other drivers. Other Racing Highlights - Invited by Lyn St. James to drive in the Womens Global GT Series - Inaugural Season in 1999. Raced SRF regionally in 1997. Started competing in SCCA wheel-to-wheel events in 1995 in ITA and ITB classes. Began racing in 1992 in Corvette autocross/solo competitions.